I’m so happy to have discovered this website! Now, I’m not a “Hipster”! I’m a “Hip-Wreck”! I have been diagnosed with ostheoarthritis of my left hip about two years ago. “Bone on bone”. I am very scared of the idea of surgery. My health is good, so my risks are low for complications. That’s not so much my fear. My fear is it’s irreversibility, and the long-term implications and overall impact of the surgery. If it does not work as I expected …. sorry …. my hip bone and acetabulum cannot be retrieved from the hospital garbage! How does the surgery affect range of motion in the long term …. I heard you are not supposed to bend lesser than at a 90 degree angle! For how long? For life? Now, reading this article gives me hope! I have been wishing, hoping …. that new developments in medical science come up. One that really interests me is stem-cell research. I have been looking in the website at the Regenexx Clinic. Dr. Centeno in Colorado. But i cannot see so much, on the long run, what are the results in X-rays of the approach? Does cartilage actually re-grow? Or is it that pain is just relieved? And this is a new approach. It’s success seems to be higher on knees. 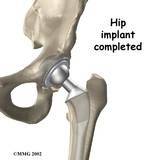 And earlier stages of hip ostheoarthritis, and for younger people. It’s not yet covered by insurance! The biggest interest I have seen is for it to be used in dogs with hip problems! (There might be hope for my 8 year old chihuahua who has been diagnosed with arthitis -apparently traumatic of her right hip -now being aasymptomatic!) Now, I see this, if it really develops, as the ideal, least invasive procedure! Since I started following Regenexx, however, clinics have developed, following Dr.Centeno’s approach, so things seem to be moving and developing! Reading this article, it addresses my fear of the long term implications of hip surgery. I have heard about the anterior approach, and how it accelerates recovery, but nothing I saw before emphasized and addressed so well the roots of my fear. The impact of total hip replacement on range of motion (it’s not like I have lots of range of motion – i walk with a cane, and I have pain and stiffness – but I have the HOPE that something is going to happen, because medicine progresses so much!) My prospective surgeon practices the anterior approach – which, if at the end I go for surgery – is the approach I’m interested on. By God, this website is so full of good information! Thank you so much! I always wanted also to see people recovering, you provide so much detail! So many good things to read!